Swathed in hundreds of miles of snaking hinterland, the northwestern Indian state of Rajasthan is a giant canvas for the imagination of the wanderers it gives home to. Through the stark reaches of the vast Thar desert, Rajasthan shares borders as well as bloodlines with the Pakistani provinces of Sindh and Punjab to the west and the Indian state of Gujarat to the south. The state's rough history and harsh environment is heavily reflected in the Rajasthani people and Marwari tribal culture; centuries of continuous invasions, epic battles, brutal slaughterings and various rulings by Scythians, Mauryans, Satraps, Gurjars, Mughals, Rajputs and the British have left their traces in local folklore in the shape of storytelling, songs and plays. In Rajasthan's modern-day avatar, daily life is controlled by power failures, lasting droughts, dried out or diverted rivers and an ever-advancing desertification. These hardships of the past and present have equipped the Rajasthani people with their notoriously resilient and proud character and are clearly voiced in the music of the region. This compilation has been recorded in various cities, villages and remote regions of Rajasthan as part of a two-month road trip seeking found folklore, of which one month was spent in the holy town of Pushkar, where we experienced different aspects of Rajasthani cultural and Hindu religious life. Flexible improvisation, good chance and often pure luck allowed these recordings to happen when musicians of different ages and castes crossed our path along the way. 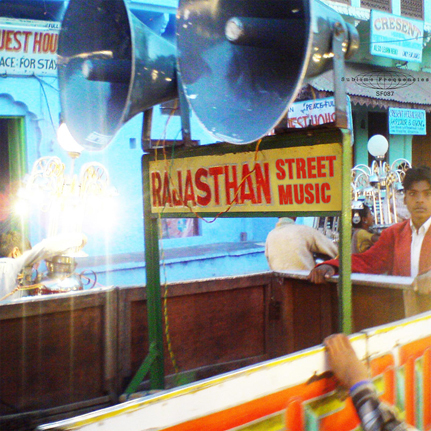 This collection does not focus on the contextual technicalities of musical lineage, castes or styles and is neither an exhaustive folkloric research project nor an ethnomusicology study; rather, it presents the musical landscape of contemporary Rajasthan on the street level as it was found in 2007-2008, a cross-section of aural environment outside of the academic approach to Rajasthani music that many western and Indian scholars have already covered in intricate detail. The most important criteria for recording these musicians in their homes or on the streets was the personal beauty of raw power in their music. Limited Edition 2-LP in a full-color heavy gatefold jacket with images of the musicians and detailed liner notes by compiler and producer Seb Bassleer.